Former Lincoln Mayor Bill Harris died unexpectedly Monday night. 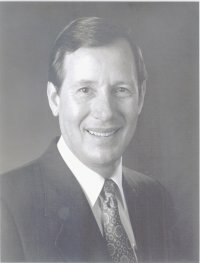 Harris, who was born in Charlotte, N.C., served as a Democratic mayor of Lincoln from 1987 to 1991. He was 71. I am deeply saddened. His honor would join us at coffee at The Mill on Sundays every now and again. He would stop by as our group was gathering and share a story or two, always carrying a newspaper or two. We thoroughly enjoyed his company and stories. He shall be dearly missed. My thoughts are with his family. It is certainly sad to see such a friend of the community pass so suddenly. He was a loyal servant to this city,as well as the state. I am glad he was a friend of mine. My heart goes out to the Harris family. I am proud to say his campaign for governor was the first I worked on, and because of him, my life was changed. He will be missed by many. This is sad. He was too young to leave us. Mr. Harris was my Economics and U.S. History teacher at East High School in 1970-71. Partly due to his influence I became a high school social studies teacher and I always enjoyed seeing him in later years. He greeted me warmly with his unforgettable smile. My heart aches for his family and close friends. This makes me so very sad. I hadn’t heard until this moment. I had the absolute honor of working for Bill as his press secretary in the Mayor’s Office in Lincoln. I always remember how close he was to his brothers . . . and what a fun spirit he had. This is truly a loss.